Apple rolls out update for Mac OS Sierra to fix security vulnerabilities. Yesterday, a security loophole in MacOS was discovered. This vulnerability enables a person with physical access to an Apple to gain administrative rights without entering password. The vulnerability was revealed on Twitter yesterday afternoon. Apple ensured that it was working on the issue and also published a guide to secure Mac. The security loopholes allow the user to view files and even change or reset the password. Moreover, the user could also remove or alter the Apple ID email address for the pre-existing users..
WHAT ARE THE FIXES FOR RELEASE? Once the loophole was discovered, Apple didn’t take much of a time to fix the issue and released the fix within 24 hours. The security update released is named as 2017-001. The update is available for 10.13.1. 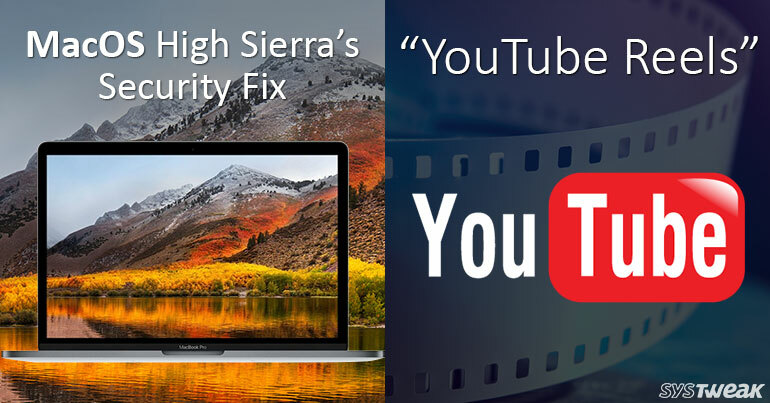 The fix ensures that the Mac is immune to the security vulnerabilities. Now YouTube will allow you to add a story which is named as Reels. Just like Snapchat, Instagram, Skype, Facebook and another app, YouTube has launched a new feature called Reels. Reels is not exactly like the Stories feature of other apps. It is YouTube’s version of Stories. Unlike other apps, Reels would not be displayed on the top of the app, it would be given a dedicated tab on a creator’s channel instead. The launch of Reels’ beta version was announced today. For now, Reels would be available to some of the creators for testing and feedback. The concept behind launching Reels is to give creators a platform to express themselves and engage more users without having posted full videos. The creators can make quick mobile videos of the 30s each with music, filters, text and more. Moreover, you can also add YouTube stickers to it. Unlike, other apps the Reels won’t expire. The launch of Reels is one of the major changes for YouTube Community and YouTube itself. It will also allow a user to react on the Reel just like any other videos by liking, commenting on it. IS YOUTUBE JOINING THE LEAGUE OF OTHER SOCIAL MEDIA PLATFORMS? It seems like YouTube is indeed joining the league but it has a different purpose and also doesn’t restrict users. Looks like YouTube is joining the league to lead the way. Reels will give an advantage to the creators as well as the users. As it can be posted in a different tab and doesn’t expire. It also benefits the viewers as they could choose whether they want to watch the video or not. If the users like Reels, YouTube will comprehend it as a sign that you like to see them frequently. One of the changes in YouTube Community is how posts are displayed to viewers. With the change, now the viewer will see Community post of the creators in their news feed they frequently visit, even if there are not subscribers to the channel. It has also worked on notifications so that it doesn’t annoy a user with notifications now and then. You must be excited to know when Reels would be available. Well, there is no news when Reels would be out in public and which creators would get it first. What’s Your Pick: Anime Or Cartoon?